Here are Julianne and I before we left on our hike today from Carran. Here is just another ancient ruined castle. I haven’t tired of them yet. It was great meeting a man today who is driving his tractor. He was giving us directions to find some of the sites on our hike. We had so much fun listening to him. I have no idea with the structure is but I love the tree that was next to it. We did quite a bit of road walking today. Here we are entering the western end of the Burren National Park and walking through Hazel trees. Is the smallest national Park in Ireland. This spring day was actually a warm one. Here is a close-up of the trees. 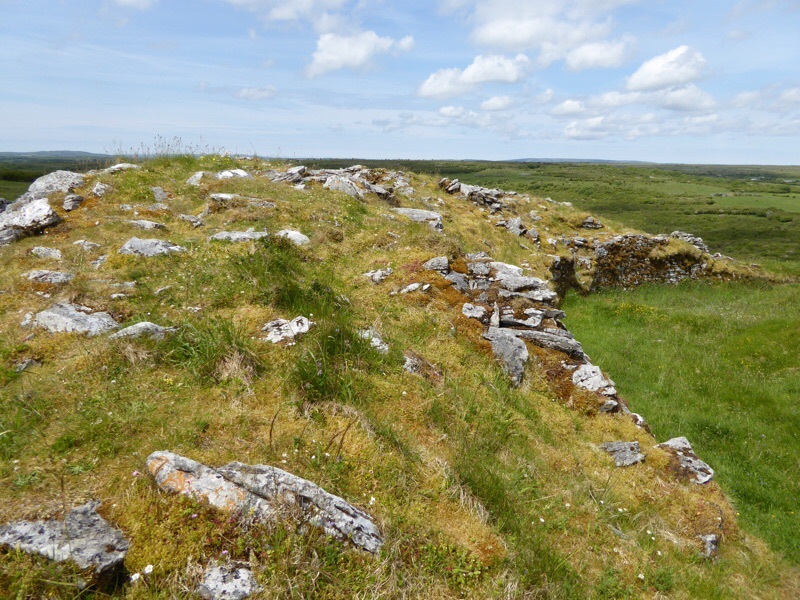 We took a detour and walked an extra kilometer, mostly uphill, to the triple walled the fort of Cahercommaun. It was probably built by a king and 800 A.D. They may have used it as a center to collect tributes for King Caher. The inner ring was built with mortar and 16,500 tons of stone. You can see how thick it is from looking at the top view of the grass growing over it. They found the remains of six houses, workshops, and sheds. There were two principal houses and have an underground passage. It led to the vertical cliff and was probably an escape route. There were 3 separate walls. Fifty-five spindle whorls found during the excavations suggest that wool production was an important part of their economy. The combing, spinning, and weaving of the yarn may have been carried out by female slaves. Okay, I know most of you have seen turkeys before. I just thought it was interesting to watch these two doing the mating dance. She really wasn’t wanting to have anything to do with him. Parknabinnia is the most accessible of more than a dozen tombs in this field. The ridge around the fields was once held in high spiritual regards for the people that lived here. Perhaps you can get a sense of the size of this tomb with me standing next to it. 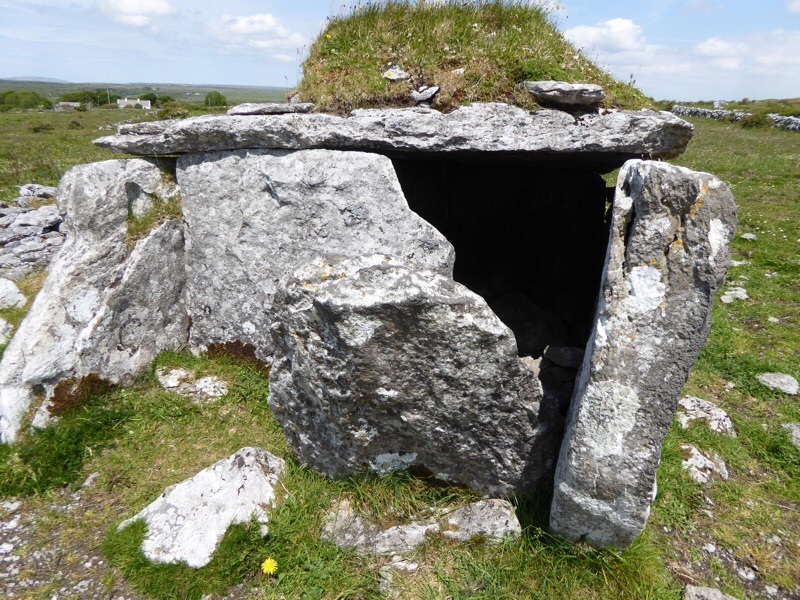 I read that there are megalithic quarries in the remains of the Stone Age settlement in the fields near this tomb. We had a view of Lough Inchiquin. We passed a couple of other old ( probably an understatement ) buildings that I really liked. So here are the photos of them. I think this is a great wall. I finally got a picture of a bird in the field. There were three of them. Does anybody know what it is? I can’t remember if I’ve already said that we are in hearing cuckoo birds almost every day. When we were in Ballyvaughan, We saw posters about the Cookoo Festival that they have every year in Amaya to welcome back the cuckoo bird. Toward the end of today’s hike we saw the rooms of an old Georgian house that used to belong to the Blood family. The notorious Colonel Thomas Blood is famous for stealing the English crown jewels in 1671. He was caught, but used his charm and instead of being hung for his crime he was pardoned by the King of England and given a royal pension. Sounds like some of our politicians. We crossed over the River Ferguson several times. We were supposed to be able to see an intricate design of weirs and fish ladders that were constructed with an old water wheel. But I never did find them. We ended today with another great dinner in a great pub in Corofin. Well, this is the end of my postings about our hikes. We have walked about 360 miles in wonderful Ireland. Some of the days were long and hard and may have been better to split into two days, But as sore as I was at the end of those days, I always recovered to walk the next day. There are several places it would have been nice to have spent more time. Tonight I will be packing up my poles and my boots. Maybe by the end of the week I will be back to doing my short hikes in Portland. Most importantly, I want to say again how friendly, helpful, fun to be with, and generally delightful the people of Ireland have been. I will so miss listening to them talk. So many of them go way out of their way to help us. I know that I left many things out each day when I wrote the posts. It was just hard to remember everything. Another thing I have been thinking about in the past couple of days is how palpable the connection the people of Ireland have with their past. Many of our bed-and-breakfast have been in the homes of the ancestors of the people who run them. But it goes beyond that. I have traveled in many countries with long histories, but there’s something about the connection here that feels much stronger to me. We actually changed our plan for the last day of this trip. Tomorrow we will be going on to Bunratti for the day because Julianne thought we would enjoy it there. I hope to find a pub that has some music just one more time. Then home from Shannon on Tuesday. I am really, really looking forward to seeing my family and my friends in Portland. The feelings about Ireland will be with for a long time. Categories: Walking Ireland 2015 | Tags: Burren National Park, Carran, Lough Inchiquin, Parknabinnia | Permalink. Hope you have a good last day and a calm flight home. Thanks for sharing your wonderful trip. Have a safe trip home. I too, have only heard wonderful comments about Ireland. I enjoyed reading your blogs and especially the pictures.